This page will describe how to add/remove/change any service supported by the server. This includes file transfer services such as an FTPS or an SFTP server, as well as utility services such as the Local Manager service or the local file system monitor service. The server can operate an arbitrary number of services, from a single instance / process. Multiple services with different or similar configurations can be defined for the same protocol. A new service can be added or changed via Local Manager below. Options will differ depending on which service type is used. 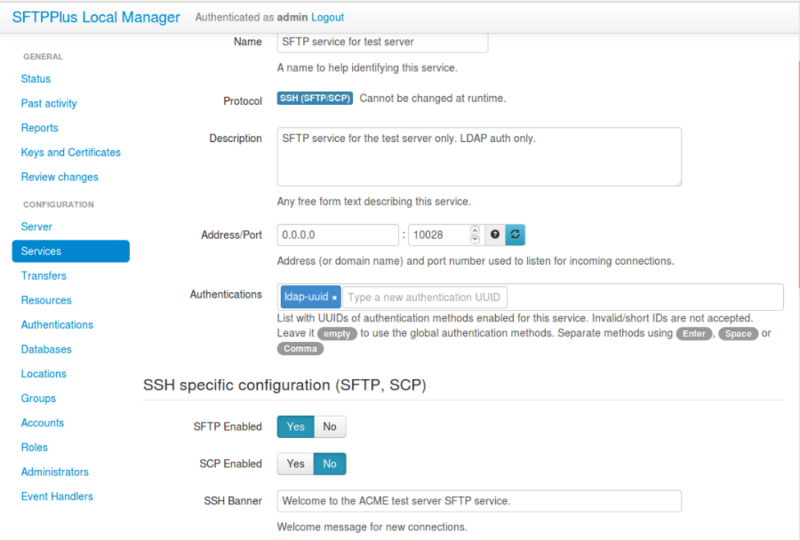 See below for an example of an initial configuration with the SFTP service. Services are added or removed by editing the configuration file. A set of configuration options specific to each protocol type. All configuration options for a service are grouped inside a section. A section is started by adding a section identifier enclosed by square brackets. The section identifier is an arbitrary name containing only alpha-numeric characters, underline (_), or dash (-) characters. No spaces are allowed. The section identifier should be prefixed with services/ and followed by the server’s universally unique identifier (UUID). A service UUID can be any unique string used to identify the server. Once defined, the service UUID should not be changed. To rename a service, use the [services/UUID] name configuration option. The service’s UUID is used for auditing purposes, i.e. to record renaming operations, and to allow operating a service in a multi-service/multi-node clustered environment. On the following sections you will find details about the configuration options available for all the server-side services. Each service has its own set of configuration options. They are described on dedicated pages. Yes - to automatically start the service when the server is started. No - to leave the service stopped when the server is started. When a service is not automatically started, it can still be manually started afterwards from the Local Manager. Human-readable short string used to identify this service. ftp - for FTP and Explicit FTPS services. ftpsi - for Implicit FTPS services. ssh - for SSH services providing the SFTP and SCP protocols. http - for HTTP services. https - for HTTPS services. monitor - for local file system monitor services. manager - for Local Manager services. The main option which defines what protocol will be used for this service. FTP and Explicit FTPS are using the same ftp protocol type, since both protocols can be served by the same service. The sftp option is also available for backward compatibility, and has the same effect as the ssh option. This is the old option to configure the protocol used by the service and should be replaced by the type option. This option is present to assure backward compatibility. When the type option is also defined, this configuration option is ignored. Host name or IP used to listen for incoming connections. To accept connections on all available IPv4 interfaces, use the 0.0.0.0 address. To accept connections on all available IPv6 interfaces, use the :: address. On some operating systems (for example Linux) setting the address . to :: will listen to all available IPv6 and IPv4 addresses. This option is ignored for services of type monitor . Port number used for incoming connections. To avoid conflicts between different services on the same local machine, this must be a unique port number. On Unix and Linux systems, a root account is required for using ports below 1024. Any text describing the role of this service. This can be used for attaching notes to a service. Comma separated list of authentication UUIDs . Comma-separated list of UUIDs for the authentication methods enabled for this service. The list should be ordered by priority. The service will try to use the first authentication from the list, and continue with the following method if the user is not accepted. If this configuration option is empty or is left out the global authentication methods are used. This configuration option is ignored for the monitor service as this service does not authenticate clients.